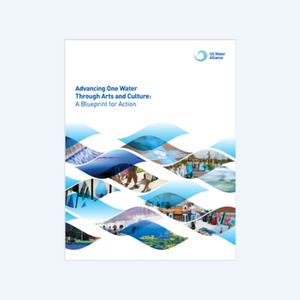 The US Water Alliance believes that arts and culture can move the needle for One Water management—an approach to water management that is inclusive and integrated to ensure a sustainable water future for future generations. Efforts to integrate arts and culture into the water sector have been sparse to date. But there are some exciting examples of how water and wastewater utilities, conservation organizations, and water reliant businesses—including US Water Alliance members—are making invisible water systems visible, engaging and educating the public in new ways, taking a creative approach to planning, and transforming communities through art. To accelerate these innovative and promising efforts, the US Water Alliance partnered with ArtPlace America to catalogue the best and brightest models and partnerships that are utilizing arts and culture to advance sustainable, integrated and equitable water management.